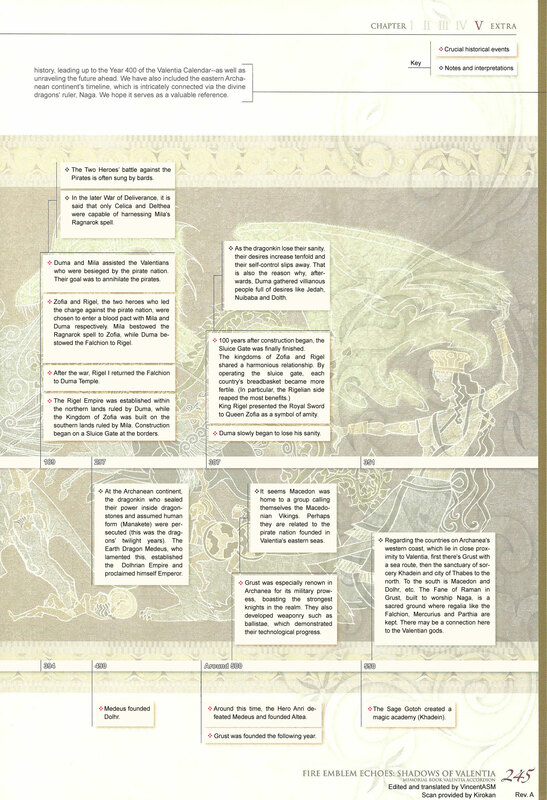 The following timeline was included in the Valentia Accordion, an art book released during March 2018. 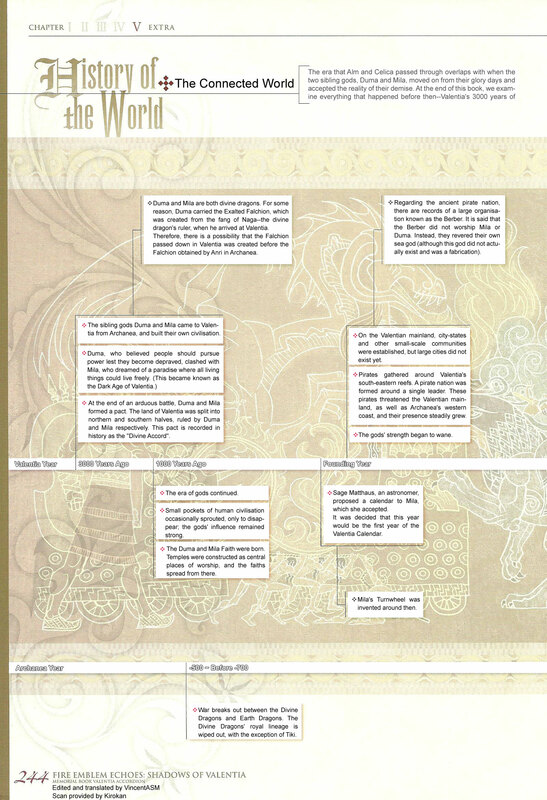 A shorter timeline was also featured on the Japanese official site. The sibling gods Duma and Mila came to Valentia from Archanea, and built their own civilisation. At the end of an arduous battle, Duma and Mila formed a pact. The land of Valentia was split into northern and southern halves. Mila ruled over the south, while Duma ruled over the north. This pact is recorded in history as the “Divine Accord”. 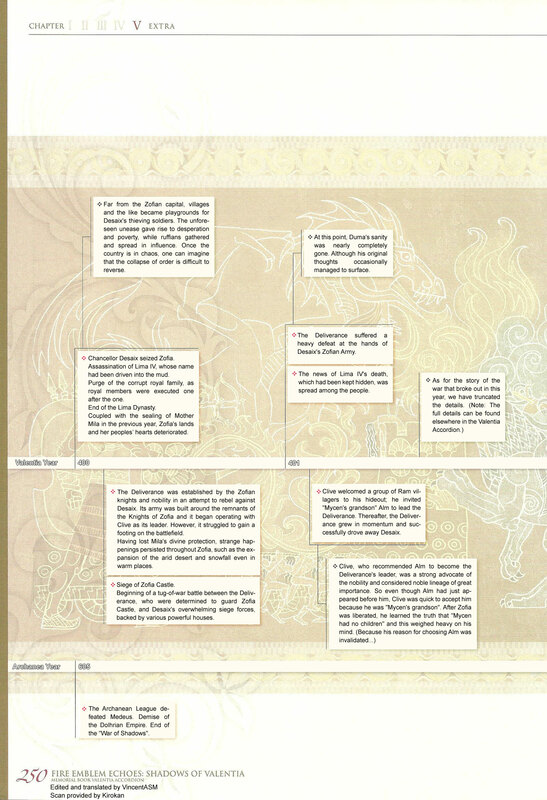 Note: Duma and Mila are both divine dragons. For some reason, Duma carried the Exalted Falchion, which was created from the fang of Naga–the divine dragon’s ruler, when he arrived at Valentia. Therefore, there is a possibility that the Falchion passed down in Valentia was created before the Falchion obtained by Anri in Archanea. The era of gods continued. Small pockets of human civilisation occasionally sprouted, only to disappear; otherwise the gods’ influence remained strong. The Duma and Mila Faith were born. Temples were constructed as central places of worship, and the faiths spread from here. Sage Matthaus, an astronomer, proposed a calendar to Mila, which she accepted. It was decided that this year would be the first year of the Valentia Calendar. Note: It seems Mila’s Turnwheel was invented around this time. On the Valentian mainland, city-states and other small-scale communities were established, but large cities did not exist yet. Pirates started to gather around Valentia’s south-eastern reefs. A pirate nation was formed, essentially around a single leader. The pirates threatened the Valentian mainland, as well as Archanea’s western coast, and their presence steadily grew. The gods’ strength began to wane. Note: Regarding the ancient pirate nation, there are records of a large organisation known as the Berber. It is said that the Berber did not worship Mila or Duma. Instead, they revered their own sea god (although this god did not actually exist and was a fabrication). Duma and Mila assisted the Valentians who were besieged by the pirate nation. Their goal was to annihilate the pirate nation. Zofia and Rigel, the two heroes who led the charge against the pirate nation, were chosen to enter a blood pact with Mila and Duma respectively. Mila bestowed Ragnarok to Zofia, while Duma bestowed the Falchion to Rigel. After the war, Rigel I returned the Falchion to Duma Temple. The Rigel Empire was established within the northern lands ruled by Duma, while the Kingdom of Zofia was built on the southern lands ruled by Mila. Construction began on a Sluice Gate at the borders. Note: Apparently, the battle between the Two Heroes and the Pirates is often sung by bards. Note: In the later War of Deliverance, it is said that only Celica and Delthea were able to harness Mila’s Ragnarok magic. 100 years after construction began, the Sluice Gate was finally finished. King Rigel presented the Royal Sword to Queen Zofia as a symbol of friendship. Duma slowly began to lose his sanity. Reign of Lima II of Zofia and Rigel III of Rigel. Mycen rose to fame as a Rigelian knight. He was regarded as an outstanding hero and he was close friends with Rudolf and Nomah. Trouble arose within Zofia’s political circle; by request of Lima II, Mycen sortied Rigelian troops into Zofia. This helped Lima II immensely and stability returned to the government. Mycen received massive praise from Lima II for his achievements. He was requested to remain in Zofia and was appointed as a Zofian general. Note: At this time, Rudolf and Mycen were in the prime of adolescence. They were thoughtful yet hot-blooded men, who would stay up all night to debate Rigel’s future and current state. Note: Mycen had a strong relationship with Rudolf and was extremely devout to his nation, so it’s unclear why Mycen accepted the offer to become a Zofian general. There is one theory that suggests a certain Sister Nadia from the Temple of Mila put in a good word. Note: Mycen remained single and there are no records of him having children. So even if he had found a partner, it is unlikely that a relationship lasted long. Emperor Rigel III of Rigel appointed Rudolf as his successor; Rudolf I’s coronation. Following his ascension, the young Emperor Rudolf met with the War Father at Duma Temple. During this time, it is said that Rudolf sensed Duma’s disturbing descent into madness. Rudolf pledged dominion of Valentia to Duma. However, he did not specify the time of invasion; instead, he ruled while promising to prepare for war. Thereafter, in order to convince Duma of his intent to conquer Zofia, he bolstered the Rigelian army’s armaments. Note: Around this time, it seems Duma had already lost most of his sanity. 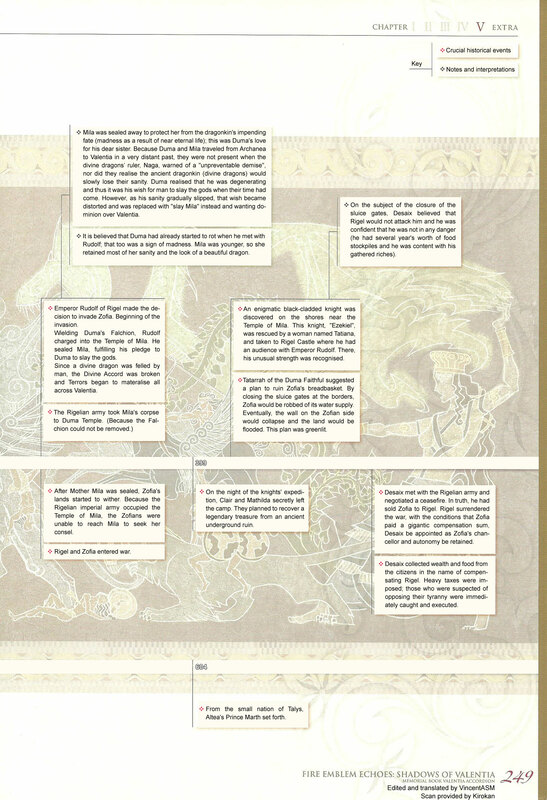 Defeating Mila’s scions, urging Rigel to conquer Valentia–one could say Duma was trapped in an obsession of making the entire world belong to him. Note: To be able to stand up to a mad god and his delusions, Rudolf I must have put up a brave face. Death of Lima III of Zofia. He was succeeded by his heir, Lima IV. Lima IV arrogantly flexed his power and began a reign of tyranny. Enmity towards him was strong on all fronts. Note: Lima IV inherited the Zofian throne at a young age, when he was essentially just a child. Unfortunately, he lacked proper custodians who dared to rebuke him and guide him away from his wayward path. An assassination plot against Lima IV was exposed. The perpetrators–a branch of the royal family–were executed along with their kin. Desaix, who claimed to have prevented the plot, received Lima IV’s recognition and started to participate in governmental affairs. 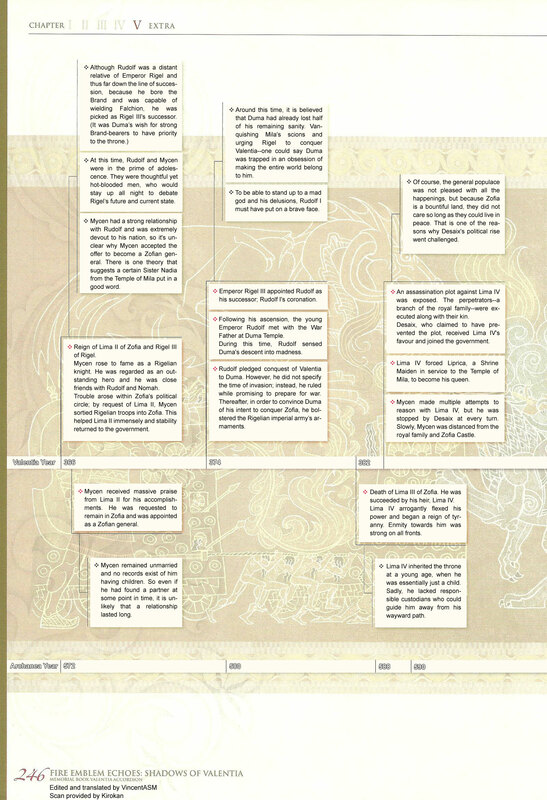 Lima IV forced Liprica, a Shrine Maiden in serve to the Temple of Mila, to become his queen. 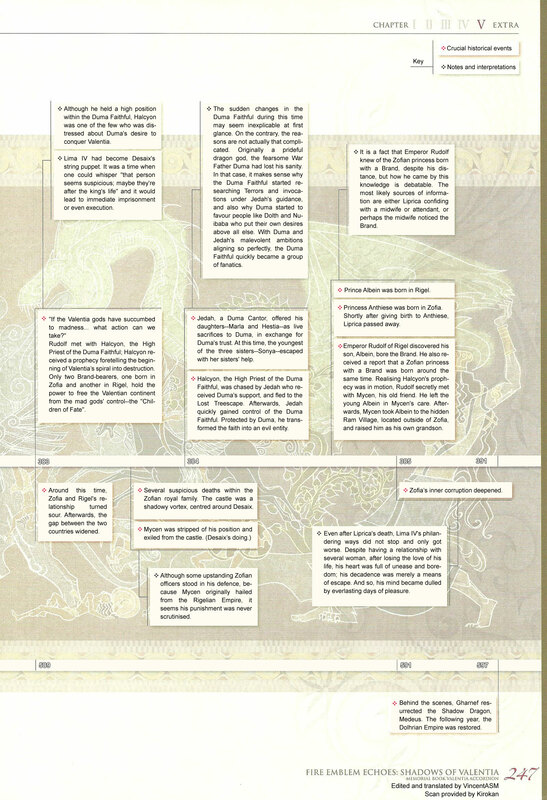 Mycen made multiple attempts to reason with Lima IV, but he was stopped by Desaix at every turn. Slowly, Mycen was distanced from the royal family and Zofia Castle. Note: Of course, the general populace was not pleased with all the happenings, but Zofia is a bountiful land, and thus they did not care so long as they could live in peace. That is one of the reasons why Desaix’s political rise went challenged. Rudolf met with Halcyon, the High Priest of the Duma Faithful; Halcyon received a prophecy foretelling Valentia’s spiral into destruction. Only two Brand-bearers, one born in Zofia and another in Rigel, hold the power to free the Valentian continent from the gods’ control–the “Children of Fate”. Around this time, Zofia and Rigel’s diplomatic relationship turned sour. After that, the gap between the two countries widened. Note: Although he held a high position within the Duma Faith, Halcyon was one of the few who was distressed about Duma’s desire to conquer Valentia. Note: Lima IV had become Desaix’s string puppet. It was a time when one could whisper “that person seems suspicious; maybe they’re after the king’s life” and it would lead to immediate imprisonment or even execution. Several suspicious deaths within the Zofian royal family. Zofia Castle had became a vortex of conspiracy and death, centred around Desaix. Mycen was stripped of his military position and exiled from Zofia Castle. This was thanks to Desaix. Note: Although some Zofian officers stood in his defence, because Mycen originally hailed from the Rigel Empire, his departure was never scrutinised. Jedah, a Duma Cantor offered his daughters Marla and Hestia as live sacrifices to Duma in exchange for Duma’s trust. At this time, the youngest of the three sisters–Sonya–escaped with her sisters’ help. Halcyon, the High Priest of the Duma Faithful, was chased by Jedah who received Duma’s support, and fled to the Lost Treescape. Afterwards, Jedah quickly gained control of the Duma Faithful. Protected by Duma, he transformed the faith into an evil entity. Note: The sudden changes in the Duma Faithful around this time seem inexplicable at first glance. On the contrary, the reasons are not that complicated. Originally a prideful dragon god, the fearsome War Father Duma had lost his sanity. In that case, it explains why the Duma Faithful started researching Terrors and invocations under Jedah’s guidance, and also why Duma started to favour people like Dolth and Nuibaba who put their own desires above all else. With Duma and Jedah’s malevolent ambitions aligning so perfectly, the Duma Faithful quickly became a group of fanatics. Prince Albein was born to the Rigelian royal family. Princess Anthiese was born to the Zofian royal family. Shortly after giving birth to Anthiese, Liprica passed away. Emperor Rudolf of Rigel discovered his son, Albein, bore the Brand. He also received a report that a Zofian princess with a Brand was born around the same time. Realising Halcyon’s prophecy was in motion, Rudolf secretly met with Mycen, his old friend. He left the young Albein in Mycen’s care. Mycen took Albein to the hidden Ram Village, located outside of Zofia, and raised him as his own grandson. Note: It is a fact that Emperor Rudolf knew of the Zofian princess born with a Brand, despite his distance, but how he came by this knowledge is debatable. The most likely possibilities are either Liprica confiding with a midwife or attendant, or the midwife noticed the Brand. The corruption within the Kingdom of Zofia deepened further. Note: Even after Liprica’s death, Lima IV’s philandering habits did not stop and only got worse. Despite having a relationship with several woman, after losing the love of his life, his heart was full of unease and boredom; his decadence was merely a means of escape. And so, his mind was dulled by everlasting days of pleasure. Princess Anthiese’s residential villa (which belonged to the Lima Family) was set ablaze. Thanks to Mycen who came rushing to her aid, Anthiese escaped. However, the villa’s other residents were slain by assassins hired by Desaix. Note: Since Lima IV was still young himself, he was apathetic towards his children and matters of succession. Additionally, after Liprica’s death, he had a few sons born from his many consorts; it seems he was uninterested in his daughter, Anthiese. Therefore, when Celica’s villa burned down, Lima barely reacted when he was told that everyone inside perished. If one was a treacherous vassal, he would be an ideal king to serve. Note: Furthermore, during the fire incident at the Lima Villa, it was later discovered that a boy–one of Anthiese’s older half-brothers–successfully escaped. This boy fled to the Lost Treescape in Rigel and found himself in the former High Priest Halcyon’s care. Princess Anthiese was brought to Ram Village, where she met a boy of around the same age. That boy was Alm–in other words, Albein, who Rudolf entrusted to Mycen. Alm and Celica (Anthiese) spent their days in Ram Village, living like a real family. Desaix’s subordinate, Slayde, found Alm, Celica and the others near the outskirts of Ram Village. Celica was transported away from Ram Village by Mycen and across the sea to Nomah’s Priory, her new home. The Rigelian Empire was struck by poor harvests that persisted over the next 3 years. At the Kingdom of Zofia, Mother Mila began to exhibit signs of decline. Alm learned swordsmanship from Mycen at Ram Village. Celica served as a priestess at Nomah’s Priory. Note: The people in the Priory were aware that Celica was a lost member of the Zofian royal family. A merchant guild hired mercenaries to cause an uprising at Zofia Harbour. Note: Clive and Fernand act on behalf of the Knights of Zofia. As the poor harvests continued, the Rigelian Empire’s food stockpiles ran out. Rigel requested aid from the Kingdom of Zofia, but Lima IV responded with mockery. Emperor Rudolf of Rigel made the decision to invade Zofia. Beginning of the invasion. Wielding Duma’s Falchion, Rudolf charged into the Temple of Mila. He sealed Mila, fulfilling his pledge to Duma to slay the gods. Since a divine dragon was felled by man, the Divine Accord was broken and Terrors began to sprout all across Valentia. Note: Mila was sealed to protect her from the dragonkin’s fate (madness as a result of near eternal life); this was Duma’s love for his dear sister. Because Duma and Mila traveled from Archanea to Valentia in a very distant past, they were not present when the divine dragons’ ruler, Naga, warned of an “unpreventable demise”, nor did they realise the ancient dragonkin (divine dragons) would slowly lose their sanity. Duma realised he was degenerating and thus it was his wish for man to slay the gods when their time had come. However, as his sanity slipped, that wish became distorted and was replaced with “slay Mila” instead and wanting dominion over Valentia. Note: It is believed that Duma’s body had already started to rot when he first met with Rudolf; that too was a sign of his madness. 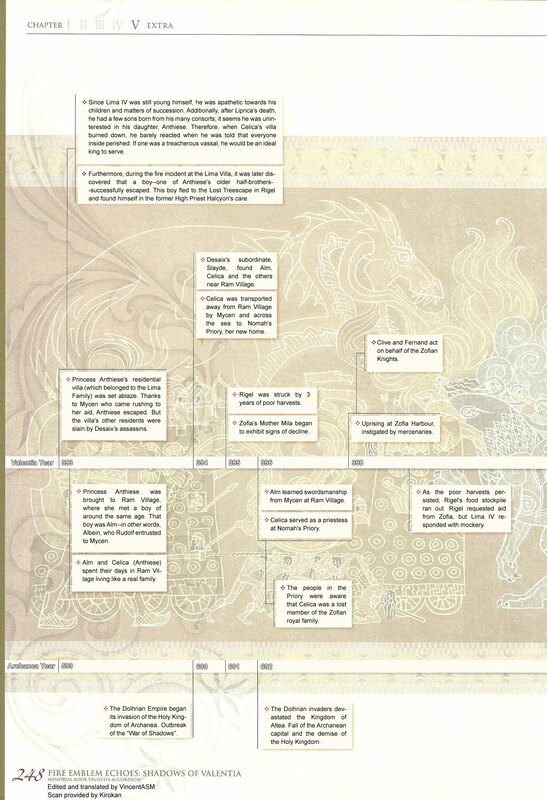 Since Mila was younger than Duma, she retained most of her sanity and the appearance of a beautiful divine dragon. After Mother Mila was sealed, Zofia’s lands started to wither. Because the Rigelian imperial army occupied the Temple of Mila, the Zofians were unable to reach Mila to seek her counsel. Rigel and Zofia entered war. On the night of the knights’ expedition, Clair and Mathilda secretly left the camp. They planned to recover a legendary treasure from an ancient underground ruin. An enigmatic black-cladded knight was discovered on the shores near the Temple of Mila. This knight, “Ezekiel”, was rescued by a woman named Tatiana, and taken to Rigel Castle where he had an audience with Emperor Rudolf. There, his unusual strength was recognised. Tatarrah of the Duma Faithful suggested a plan to destroy Zofia’s breadbasket. By closing the sluice gates at the borders, Zofia would be robbed of its water supply. Eventually, the wall on the Zofian side would collapse and the land would be flooded. This plan was green-lit and the sluice gates were shut. Note: On the subject of the closed sluice gates, Desaix believed that Rigel would not attack him and he was confident he was not in any danger (he had several year’s worth of food stockpiles and he was content with his gathered riches). Desaix met with the Rigelian army and negotiated a ceasefire. In truth, he had sold Zofia to Rigel. The Rigelian Empire surrendered the war, with the conditions that Zofia paid a gigantic compensation sum, Desaix be appointed as Zofia’s chancellor and autonomy be retained. Desaix collected wealth and food from the citizens in the name of compensating Rigel. Heavy taxes were imposed across the nation; those who opposed their tyranny–or were suspected of doing so–were immediately caught and executed. Chancellor Desaix sized control of Zofia. Assassination of Lima IV, whose name had been driven into the mud. Purge of the corrupt royal family, as royal members were executed one after the one. End of the Lima Dynasty. Coupled with the sealing of Mother Mila in the previous year, Zofia’s lands and the hearts of her people rapidly deteriorated. Note: Far from the Zofian capital, villages and the like became playgrounds for Desaix’s thieving soldiers. The unforeseen unease gave rise to desperation and poverty, while ruffians gathered and spread in influence. Once the country is in chaos, one can imagine the collapse of order is difficult to reverse. The Deliverance was established by the Zofian knights and nobility in an attempt to rebel against Desaix. Its army was built around the remnants of the Knights of Zofia and it began operating with Clive as its leader,. However, it struggled to gain a footing on the battlefield. Having lost Mila’s divine protection, strange happenings persisted throughout Zofia, such as the expansion of the arid desert and snowfall even in warm places. Beginning of a tug-of-war battle between the Deliverance, who were determined to guard Zofia Castle, and Desaix’s overwhelming siege forces, backed by various powerful houses. The Deliverance suffered a heavy defeat at the hands of Desaix’s Zofian Army; afterwards, they escaped safely. The news of Lima IV’s death, which had been kept hidden, was spread among the populace. Note: At this point, Duma’s sanity was nearly completely gone. Although it seems his original thoughts occasionally managed to surface. Clive welcomed a group of Ram villagers to his hideout; he invited “Mycen’s grandson” Alm to lead the Deliverance. Thereafter, the Deliverance increased in momentum and they successfully drove away Desaix. 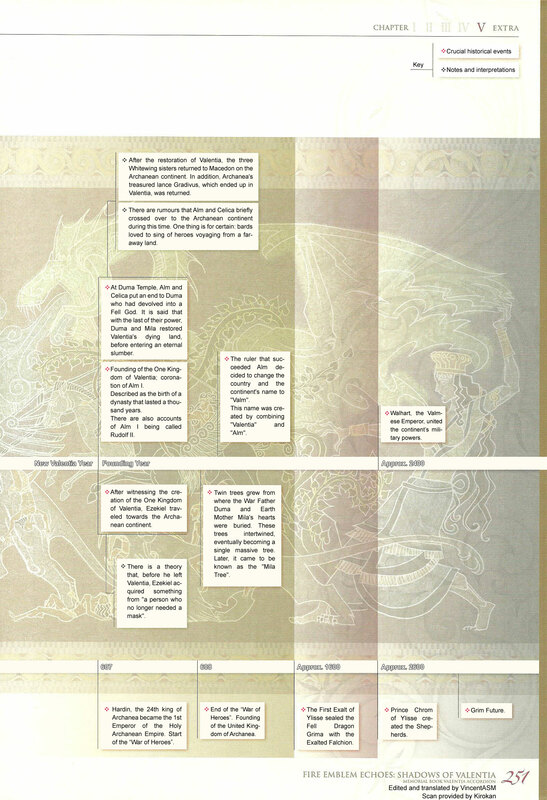 At Duma Temple, Alm and Celica defeated Duma who had devolved into a Fell God. It is said that with the last of their power, Duma and Mila restored Valentia’s dying land, before entering an eternal slumber. Founding of the One Kingdom of Valentia. Coronation of Alm I. Described as the birth of a dynasty that lasted a thousand years. There are also accounts of Alm I being called Rudolf II. Note: After the restoration of Valentia, the three Whitewing sisters returned to Macedon on the Archanean continent. In addition, Archanea’s treasured lance Gradivus, which ended up in Valentia, was returned. Note: There are rumours that Alm and Celica briefly crossed over to the Archanean continent during this time. One thing is for certain: bards loved to sing of heroes voyaging from a faraway land. After witnessing the creation of the One Kingdom of Valentia, Ezekiel left for the Archanean continent. Note: There is a theory that, before he left Valentia, Ezekiel acquired something from “a person who no longer needed a mask”. Twin trees grew from where the War Father Duma and Earth Mother Mila’s hearts were buried. The trees intertwined, eventually becoming a single gigantic tree. Later, it came to be known as the “Mila Tree”. The ruler who succeeded Alm decided to change the country and continent’s name to “Valm”. This name was created by combining “Valentia” and “Alm”. The Valmese Emperor Walhart united the continent’s military powers.